MoCreebec Council of the Cree Nation has suffered a tremendous loss in the passing of its political leader Chief Randy Kapashesit. Since 1987 and over the past 25 years Chief Randy has provided leadership for the MoCreebec organization until his sudden passing on Wednesday, April 25th, 2012. Randy first got involved with MoCreebec in the early 1980s a young man in his early twenties at the time, still a student at York University in Toronto completing a political science major. He graduated from York around 1986 and after graduation he agreed to join and work with MoCreebec on fulltime basis. 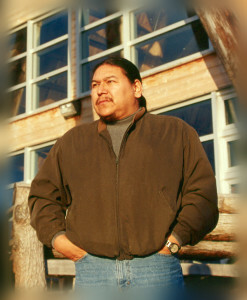 It wasn’t long after joining MoCreebec that his peers/colleagues noticed his intelligence, his ability to express and articulate ideas, his skill to understand aboriginal issues of the day and to formulate strategies in how best to approach in dealing with those issues especially as it concerned MoCreebec. He was asked to consider taking on the role as political spokes-person for MoCreebec. He agreed to take on this new role with one condition that MoCreebec people be prepared to do something “different” (as he put it). Over the years Randy was instrumental in advancing the profile and plight of the MoCreebec people at the local, regional, national, international and as of late, even at the United Nations level with his recent appointment as the representative for the United Nations North American Indigenous Caucus on the planning committee for the United Nations 2014 World Conference on Indigenous Peoples. Randy was a champion in the cause of aboriginal rights. He labored hard to see native people of Canada liberated from the clutches and negative impacts stemming from colonialism. He wanted his people to regain autonomy, self-reliance and economic independence. He was committed and focused with that vision to the very end. In 1993 he spearheaded and led the MoCreebec people to design and sign their own constitution which acknowledged supremacy of God. And that the family unit, based on cultural history, traditions, values and beliefs as central in the political, social and economic life of its people. The MoCreebec constitution is a tool he has left us with in the on-going pursuit of our political and economic goals and objectives. His demeanor was always one of being calm, cool and collected in all situations. He never displayed an over-emotional reaction with anyone or to anything. His passing has left a deep void in our organization at this time. MoCreebec has lost its good right arm. This loss will be felt for quite some time. He will be sorely and sadly missed at our next and up-coming Council meetings. On behalf of the MoCreebec Council of the Cree Nation.